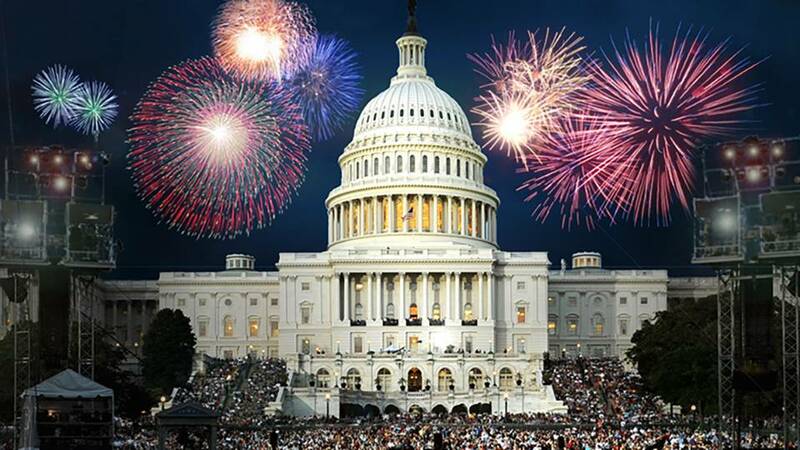 America’s favorite Independence Day celebration, A Capitol Fourth puts viewers front and center for the greatest display of fireworks anywhere in the nation. A Capitol Fourth is broadcast live from the West Lawn of the U.S. Capitol, before a concert audience of hundreds of thousands, millions more at home, and our troops watching around the world on the American Forces Network. Rhode Island PBS presents A Capitol Fourth on Tuesday, July 4 at 9:30 p.m., and Thursday, July 6 at 1 p.m.
Emmy Award-nominated actor and producer John Stamos is set to host the 37th annual edition of A Capitol Fourth. The all-star musical and fireworks extravaganza will kick off the country’s 241st birthday with performances by: soul men Dan Aykroyd and Jim Belushi of The Blues Brothers; iconic multi-platinum selling music legends The Beach Boys, featuring John Stamos (drums) and Sugar Ray’s Mark McGrath(vocals); legendary Motown stars The Four Tops; and The Voice Season 12 winner Chris Blue; with the National Symphony Orchestra under the direction of top pops conductor Jack Everly. Gifted actress and singer Sofia Carson will open the show with a special performance of the national anthem. The concert will also feature a tribute to our men and women in uniform by country music star and Grammy-nominated member of the Grand Ole Opry Trace Adkins who will perform his new single “Still a Soldier.” The inspiring moment will be dedicated to our troops and veterans, and all those who have made the ultimate sacrifice fighting for our freedom. Also participating in the event will be the Choral Arts Society of Washington, the U.S. Army Herald Trumpets, the U.S. Army Ceremonial Band, Members of the Armed Forces carrying the State and Territorial Flags and the Armed Forces Color Guard provided by the Military District of Washington, D.C. Capping off the show will be a rousing rendition of Tchaikovsky’s “1812 Overture” complete with live cannon fire provided by the United States Army Presidential Salute Battery, an audience favorite and A Capitol Fourth tradition. For more information about the tradition of A Capitol Fourth, the scheduled performers, and a taste of United States history that is the reason for this annual celebration, visit the PBS website.